This project was funded by the European Sixth Framework Programme for Research and Development and ran for one year from December 2004 to November 2005. The European Union has enacted the Environmental Impact Assessment (EIA) Directive to apply the assessment of the environmental effects of those projects which are likely to have significant effects on the environment. A report of the Commission has revealed that there are still various weaknesses in the Member States implementation. 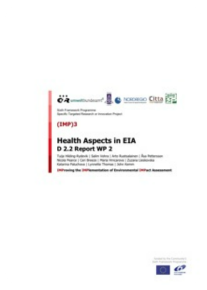 This report concerns the health aspects of EIA.